I grew up in West Palm Beach and remember going to a party in my 20's (l970's) at a private estate that was quite lavish. I learned later that it was El castillo. It was beautiful and I knew immediately that it was a Mizner creation due to all the spanish tile and Moorish influence. I wish I had been more aware of the history and I would have surely asked a thousand questions. I came upon your website today and was happy to see the house that I lived in. It is owned by my mother and has been in our family for almost 30 years. El Castillo is still a private residence and has been lovingly restored and kept up to this day. 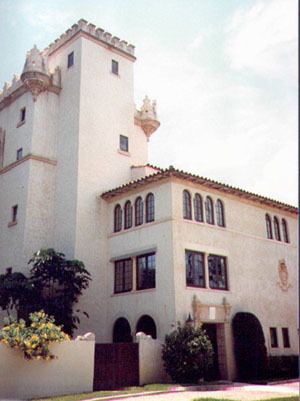 It is one of Mizner's greatest greations and is one of the grandest old mansions of Palm Beach. The home has again shown its toughness and quality construction by going through Hurricane Wilma unscathed. A special thanks to Raymond Martinez for sending in the photo.